When ever I get the opportunity, I like to get totally immersed in a story. This usually involves a story that is told in more than one medium: book, film, or documentary. Two recent examples covered in this blog are the HBO series The Pacific and the books and films related to The Mutiny on the Bounty. This time I was lucky to find a story covered by all three mediums. 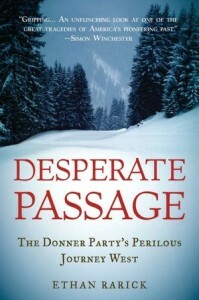 First, was the great book Desperate Passage: The Donner Party by Ethan Rarick. Second, was the documentary American Experience: The Donner Party. And finally the poorly done dramatization of the story in the 2009 film The Donner Party. So rather than write three separate reviews, I’ll combine them here. First up is Desperate Passage: The Donner Party. I read the book on my Kindle. While the story and writing were engrossing, the Kindle version lacked maps and photos, which would have added much to the enjoyment of the book. Luckily I had other sources to fall back on. I blame the publisher for this oversight and not the author. With digital sales outpacing printed copies you’d think that publishers would put a little more effort into their digital editions. But don’t let that take away from this well written adventure/survival story. Most people know enough about the story of the Donner Party to know that it took place in the mid 1800s and involved a group of people being stranded in the mountains and then being forced to resort to cannibalism to survive. This book provides the background and details that led to that horrific outcome. As a pilot, I kriss cross the country many times during a typical month. Anyone who flies a lot and spends any time at all gazing down below them, knows that in between the many populated areas lies a lot of baron, inhospitable land. So thinking about eighty-plus men, women, and children traveling half way across the country by foot and wagon train gives one pause from thirty-four thousand feet. In 1846, when the Donner Party left Independence, Missouri for California, the trip was expected to take four months. That same trip today can be made in less than three hours. If you have the chance to fly from Chicago to Sacramento or San Francisco, you’ll be passing over some of the very terrain that the Donner party traversed some 166 years ago. And a good portion of the terrain looks today as it did back then. It’s easy to look down and put yourself in their shoes. Author Ethan Rarick had a wealth of source material to draw from for this story: memoirs, books, letters, and newspaper accounts of the time. He ties all this material together to recreate the event from the departure, to the multiple rescue attempts, to its ultimate conclusion. This story has its share of heroes. Some forged ahead in search of help. Others made rescue attempts despite the danger to themselves. There were some who acted with only their self interests in mind. But the real villan in this story was mother nature. From the rain that bogged down the wagons in the mud, to the cold, to the snow that entrapped then, making it impossible to proceed forward or backward. This is a story of ordinary people caught in extraordinary circumstances. So the next time you find yourself on a plane looking down at the snow-capped Rockies or the Sierra Nevada mountains, ask yourself – what would you have done? Having read the story about the Donners, Reeds, and Graves, I wanted to see images that told the story in a way only images can. This excellent film by Ric Burns does just that. He makes good use of the limited photos available from that time period, filling in the gaps with paintings, interviews, maps, landscapes, and voice overs. It’s one thing to read about the wagon trains and the various forts along the way. It’s a whole other thing to see images of the people and places that make up this story. You can watch the entire episode online along with an interactive map and other ancillary material at American Experience: The Donner Party on the PBS website. You can also view the episode below. Watch The Donner Party on PBS. See more from American Experience. I had high hopes going into this film, but the writer/director decided that he didn’t need to do any research; he could just make it up as he went along. This film is bad on every level. The film starts with the Donner party having been stranded in the mountains for a month. Names have been changed. The weather always seems to be nice and sunny. The snow depth never appears greater than a few inches. There isn’t a child in sight. There are some references to the Hastings cutoff and next thing you know we’re off with the Forlorne Hope. But the only thing the writer/director has on his mind is cannibalism. He turns a real life story full of human drama into a poorly made zombie movie. TJ, I looked you up and saw that you were a part of the Oscar winning documentary Undefeated. So what’s your excuse here? Did you really think you had to invent conflict when the actual story had so much of it? I don’t even think you could honestly claim that this film was inspired by true events it is so far from what really happened. Bottom line. Skip this one altogether.